Utilizing the PlayStation Eye’s face-capture technology, players are placed center stage in starring roles and compete against other contestants in a series of action-packed reality themed TV shows. Striving to earn popularity and fame in the race to top of the A-list, get ready to strut your stuff and model on the red carpet, perform daring stunts in a chaotic game show, makeover celebrity homes, and much more. 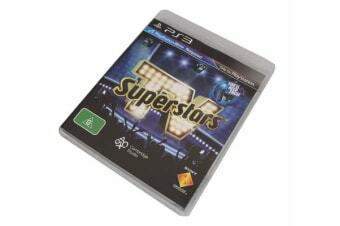 Do you have what it takes to become the next big superstar? Experience the fame, the glitz and the glamour as you become the ultimate reality celebrity in TV Superstars, a fun new social party game designed specifically for the PlayStation Move. Utilizing the PlayStation Eye’s face-capture technology, players are placed center stage in starring roles and compete against other contestants in a series of action-packed reality themed TV shows. Striving to earn popularity and fame in the race to top of the A-list, get ready to strut your stuff and model on the red carpet, perform daring stunts in a chaotic game show, makeover celebrity homes, and much more.